The variety of disposable electronics (Internet-of-Things, IoT) has grown substantially over the last decade, as prices are falling, and the selection becomes incredibly powerful. Blockchains typically require significant storage and processing resources for all of the cryptography used in the transactions they store. One of the most common, inexpensive, and powerful IoT devices is the Raspberry Pi, at $35, featuring 1GB of RAM, a 4-core processor, 802.11n WiFi, 1 network port, 4 USB ports, and Bluetooth 4 LE. The Raspberry Pi is a fully functioning computer, and it can run many different versions of Linux. In this article, we will cover the overall process for setting up a Raspberry Pi with a running RChain node on Linux. A more detailed process is captured on our GitHub webpage. When we are selecting our hardware, we have a few requirements to consider for RChain (or any blockchain). RChain relies heavily on cryptography, so it will need something with a reasonable amount of processing power, and it will need to handle very large numbers. We have chosen the Raspberry Pi 3, 3B, and 3B+, because they all offer 4-core processors and feature a 64-bit architecture. Blockchains are essentially very sophisticated databases, and they are expected to store an increasing amount of transaction data, so we have selected a 32GB microSD Card as our hard-drive. While you are setting up your Raspberry Pi, you will need a monitor (HDMI only), WiFi router, and a keyboard and mouse. Total price for our Raspberry Pi and microSD Card is $46. WARNING: If you use the wrong device for the “of” parameter, you may erase your computer. This step can take quite a while to complete (11 minutes on my computer), and you will not see any updates until it finishes. Once it is finished, you can take the microSD card out of your laptop, plug it into the Raspberry Pi, and then turn it on. After a few minutes, you will be greeted with the openSUSE login screen (username=root / password=linux). You will be taken to the desktop, and you will need to connect to your WiFi by clicking the network icon in the bottom-right corner. Congratulations! Your Raspberry Pi is set up with Linux and ready to install RChain. We have packaged the RChain installation process into 4 scripts, that will each conclude by restarting the Raspberry Pi. Building RChain and its dependencies requires significant resources, so we will need to disable the desktop and run everything from a text console. These 4 scripts may take hours to complete, and you will continuously get feedback on what they are doing until they finish with a summary of what was accomplished. The final script will re-enable the desktop after RChain is built, but it is recommended that you limit your activity while RChain is running so that it has access to as many resources as possible. At the end of this process, you will have a local RChain node built specifically for your Raspberry Pi, as well as a Docker container that you can use to run multiple nodes at the same time. You will be prompted to “Press 1 to abort, or any other key to restart”. This prompt is presented after each script is run, so you would only press 1 if you wanted to review things on the RasPi and then manually restart on your own. Otherwise, press any other key, the RasPi will restart, and you will be ready for the next step. When the RasPi restarts, you will not have a desktop anymore, and you will need to log in to the text console to continue. Again, this script will end by prompting you to press any key to restart. All of the prerequisite components have been built and installed, so we are ready to proceed to building RChain. This has been quite a journey, and your RasPi is now equipped to run RChain natively. 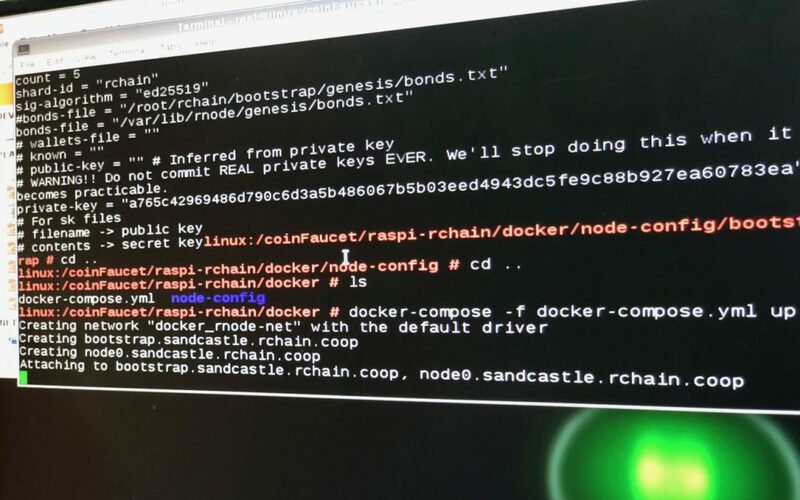 To run RChain nodes, you either need to run the ‘rnode’ command with all of its configuration details as parameters, or you will need to use the configuration file ‘rnode.toml’ that is part of the Docker setup. In the next step, we will package the RChain node as a Docker container, and we will deploy the configuration files so that you can easily start and stop nodes. In our next article, we will be doing a deep dive into writing smart contracts on RChain using its custom language, Rholang. We will show how to build a distributed application on the blockchain that is capable of massive concurrency, while solving a practical, everyday business problem: issuing and redeeming coupons with customers.